Off to find the yellow brick road! Ashley and Sabra were my companions for the journey and we arrived just in the nick of time. They roped off the door behind us and we took our seats as the lights dimmed. What a wonderful time was had by all of us. The play was fabulous, the costumes magnificient, the music inspiring!I loved the story, the sets, the comedy.It was one of my best times. 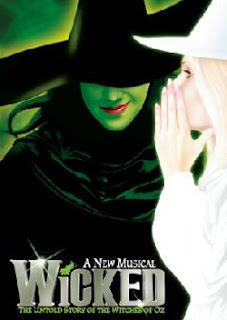 Thanks to Sabra for wanting to go see Wicked for her Christmas present this year and for Ashley getting the tickets ordered. We had a wonderful couple of days full of laughs, shopping, and of course the highlight, Wicked! I would highly recommend it to all. Fabulous show! Thank you so much for the ticket. It was truly a Festivus to remember.